The threat of stress during anesthesia and surgery in patients with bifascicular block, precipitating complete heart block, raises the consideration of prophylactic temporary pacing. Guidelines for specific indications to pace in this high risk group are not as yet clear. Certainly the classification of the conduction pathway into a three fascicle system below the His bundle has made electrocardiographic recognition easy, but the involvement of the third fascicle making a patient more vulnerable to complete heart block cannot be reliably diagnosed. In right bundle branch block (RBBB) and left anterior hemiblock (LAH), one of the common varieties of bifascicular blocks confronted clinically, the estimated incidence of developing complete heart block is between 6 and 21 percent over a five-year follow-up period (l, 2). This range of probability especially under the stress of anesthesia and surgery creates the need for temporary pacing when such patients are confronted. Similar management problems also arise with other forms of bifascicular blocks which are also known to be forerunners of complete heart block. Clinical symptoms of dizziness and syncope indicate prior transient complete heart block in these patients, if no neurological reason exists, and thus are of help in the decision making. Increased PR interval on the suface electrocardiogram was thought to indicate tri-fascicular disease but has not proved to be of much significance as shown by Levites and Haft (3). 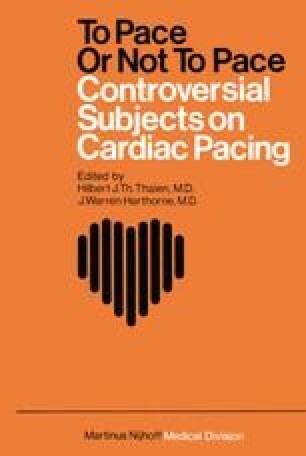 Thus, with lack of guidelines in the decision making of to pace or not to pace in this clinical setting it may be argued that the insertion of a temporary pacemaker may be a relatively b~nign procedure as compared to the occurrence of complete heart block. However, the risk of infection, ventricular ectopy and occasional myocardial perforation warrants caution to such a statement.